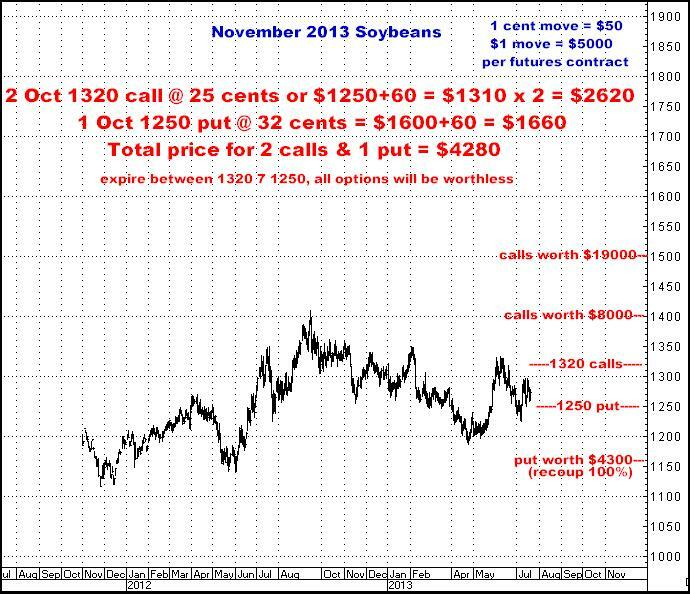 There are 3 markets with specific recommendations covered here---Corn, Soybeans and Treasury Bonds...but first a comment on the Stock Market. After selling off about 1000 points, the Dow Jones has now recovered completely and lately made new highs. Equities are definitely attracting a lot of attention right now, with enough media doubt being present to incline me towards buying again…but at the same time there seems to be a bit too much of the sentiment, “You gotta be a buyer here!” , for me to be comfortable doing so…So I will stay on the sidelines. For me, the big picture is absolutely UP, and in a big way, but for now, I can easily imagine a lot of back and forth, up and down, going nowhere for maybe the next few months. 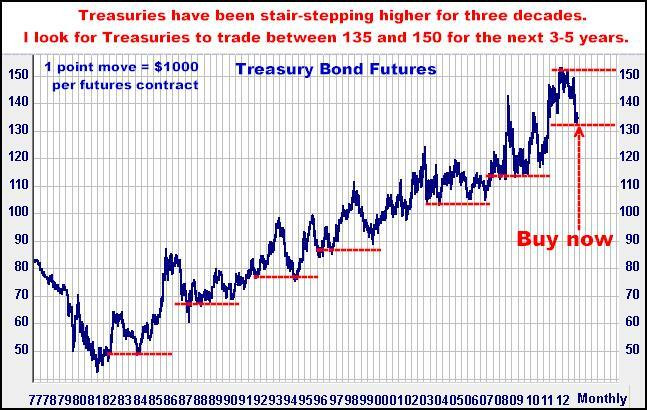 I have no doubts whatsoever about Treasury Bonds. All the talking head opinion about interest rates going higher is the same wrong way “logic” I have repeatedly heard for 30 years as long term Treasury Bond rates fell from 15% down to 2.5%. In my mind, the ONLY thing that could really drive long term rates higher (and bond prices lower) would be some sort of truly out-of-control inflation…which just isn’t going to be the case. I’ve heard those same perpetually wrong voices presenting their case for hyperinflation for the past 30 years…and it has yet to appear…and for a multitude of reasons, I seriously doubt it’s going to suddenly (finally) appear now. In a nutshell, the ages old argument that every time Federal Reserve Banks supply excess funds to this system it axiomatically results in inflation has been nothing short of bogus…and will continue to be. If you are a long time reader here, you will know that I could easily fill 20 pages with bond market commentary (it’s the only market I will ever make the statement, “I DO understand how it moves”, which is not to say I am always right about it) but it’s late on a Friday and I’m just going to keep this to the quick minimum. While I see a lot of mixed opinion about Stocks, most of what I hear about Bonds is totally one sided. Seems like 99 out of 100 of analysts and brokerage house suits are dead certain “The 10 Year is headed for 4%!” (from its current 2.5%), which I think is just as totally, totally absurd. 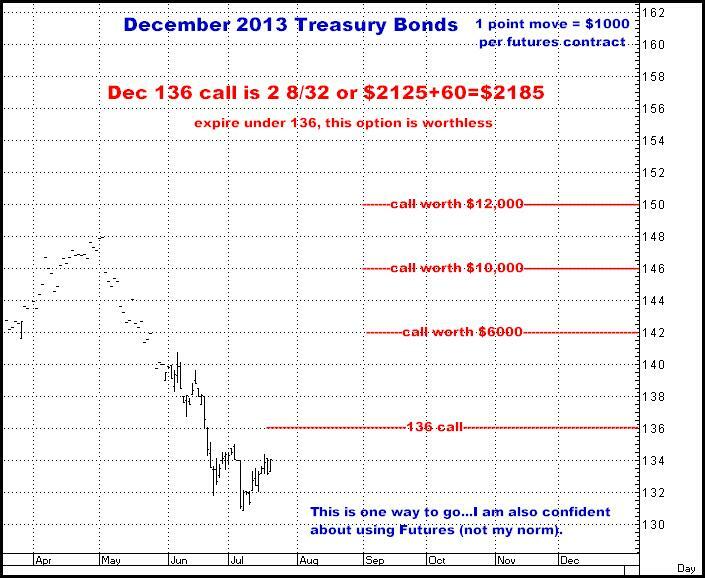 I AM BUYING BOTH THE TREASURY BONDS AND THE TEN YEAR NOTE CONTRACTS. I THINK THEY BOTH HAVE ALREADY BEGUN WHAT I THINK WILL BE QUITE LARGE RALLIES OVER THE NEXT 3-4 MONTHS. There are a number of option possibilities…Here’s just one of them…. 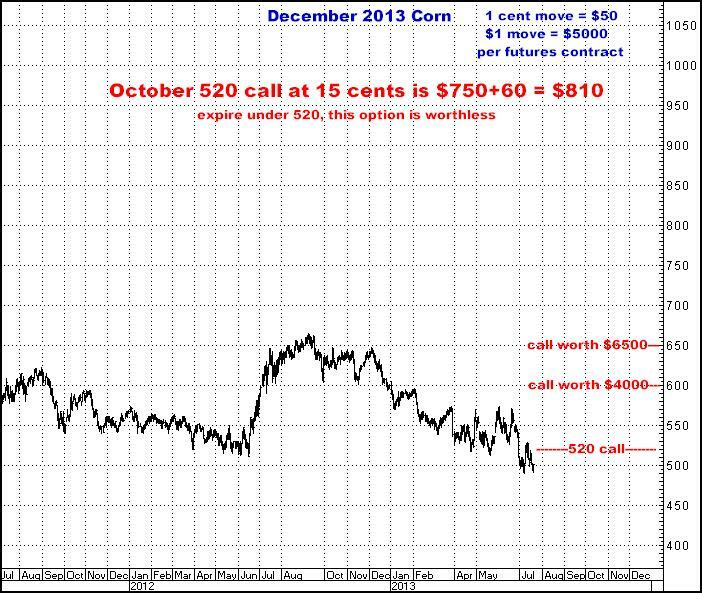 As written in my last newsletter (http://www.crokerrhyne.com/newsletters/07-15-13.htm), December Corn and November Soybeans have a long history of quite a lot of volatility between now and expiration. This does not mean the same will be repeated this year, but with both these crops having had late planting difficulties, and the perverse aspects of weather we seem to be experiencing, I am definitely now willing to bet on the buy side in these two markets. Keeping it brief…It’s no secret…Get ANY degree of weather problems during the next month and I think Corn and Soybeans could explode to the upside. And whether they will, or won’t, I certainly believe this is the letter perfect time and price to use some form of the both sides strategy (see charts below). To me, this business is about being right or being wrong, about leverage, about educated guesses and calculated risks…and I think this is as good as it gets. I may be dead wrong, but in these two markets, I think the last thing we are going to see, going immediately forward, is sideways. I say they are both going to go hard, one way or the other, and from here, I want my money on the upside. Here are a few ways to do it…I say you get a little of both Soybeans and Corn…and if there are indications it is working (right now it would be most likely accompanied by HOT, DRY weather), you get some more. 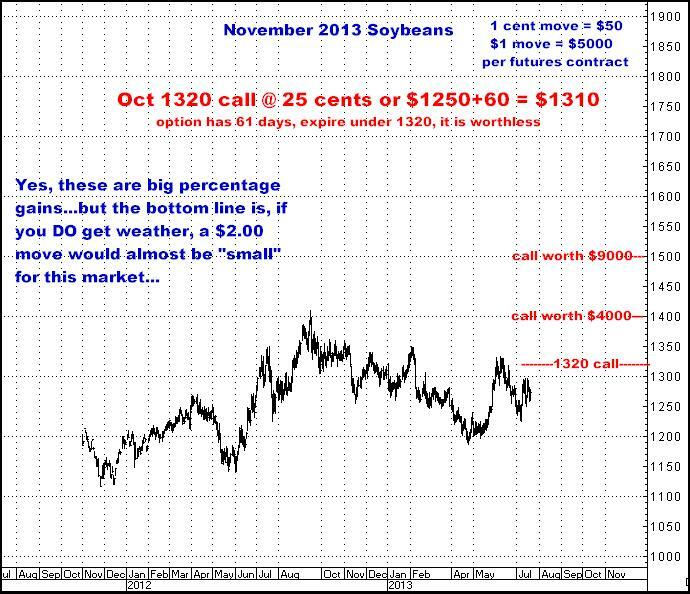 As I have noted over the years, in futures, there is generally nothing that compares to what happens when you combine bad weather and the Corn or Soybean markets. 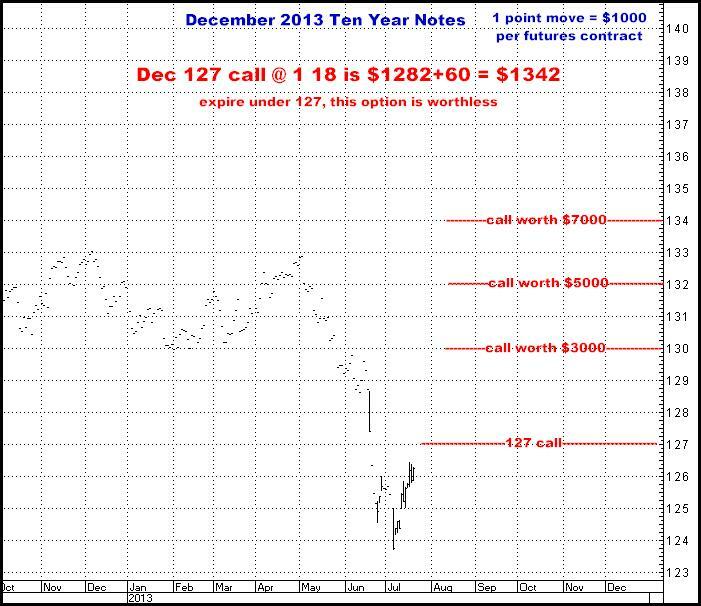 You can just buy the calls…. 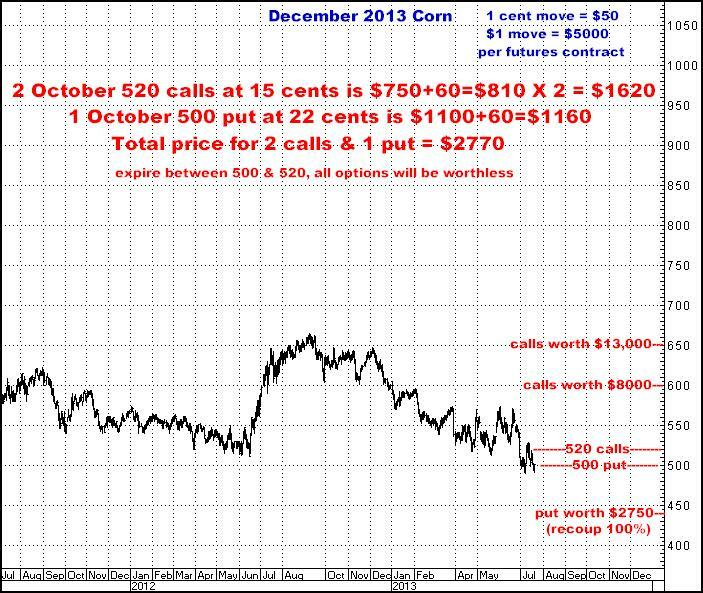 And here are the same two approaches in Corn…I would add my recommendation are all for two month Corn or Soybean options (October) as I think weather factor will have mostly played out by then…However, you can even buy less time (30 days) which is cheaper…or more time (90 days) which is more expensive. I like the October options because they give me a little of both---a little more leverage and a little more time.